#ta003 Josetxo Grieta Sonrisas vendo-¿Dónde nos llevan? Sonrisas vendo-¿Dónde nos llevan? 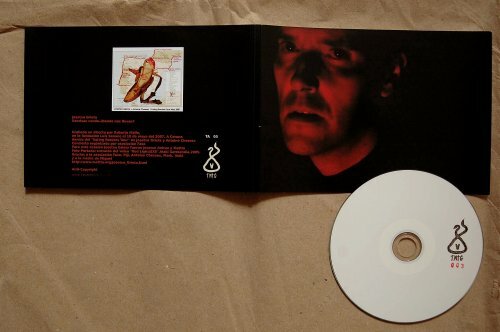 is the paradox of the fixation of a improvisation on a CD. It’s the second chance. It’s the final echo of the doppler effect. From that which were a precise air current moving through the cracks. Josetxo Anitua and Mattin kill silence. Sixteen minutes of discomfort registered on 0’s and 1’s. Cover photograph: extracted from the video “Red Light/SXE”, Iñaki Garmendia, 2005. Thanks to asociación Fase, Piji, Antoine Chessex, Mark, Iñaki and Miguel’s mother. More download formats and streaming from archive.org. For this occasion, the band consists of Josetxo Anitua and Mattin, playing guitars, electronics and other noise-emitters. I’m probably finding myself in increasingly diminishing company, but dammit, I still get something of a kick from this sort of thing. I found myself thinking, if I were in an adjacent room in a cellar somewhere hearing this clatter and wail, a smile would cross my face; “They’re clearly enjoying themselves in there.” A mere 16 minutes (probably a good idea) of audience noise, idle guitar strumming, mumbling, screaming, crooning, extreme raucous noise, etc. Fun! All liners notes of this one are in Spanish (or is it Basque?) and as far as I can tell the material on the CD was recorded on may 10, 2007 during the “Eating Borders Tour” of Josetxo Grieta and Swizz Saxwizz Antoine Chessex. A tour that for the larger part followed the coastlines of France, Spain and Portugal. For this occasion Josetxo Grieta were Josexto Anitua (also member of Cancer Moon, and according to the label’s website passed away recently) and Mattin [website]. Though this CDr is not released on Mattin’s own label, but on Taumaturgia, a label I hadn’t heard of yet, it has all the characteristics of a Mattin-release, up to the Anti-copyright-statement and its non-standard-size. The CDr’s one and only track is some 16 minutes in length, and starts off in an acoustic, almost folky atmosphere: we hear someone strike an acoustic guitar, while the vocals that accompany it are half spoken, half sung, at regular intervals they turn into shouting, and things grow only harsher and wilder from there on (as a side-note: I first thought that this was a solo-project). As I don’t know Spanish (nor Basque) I don’t know what the lyrics are about, but knowing Mattin’s work I can imagine that they aren’t random. It’s a live recording, and such relases are often anecdotical, or to be regarded as documenting a particular evening – As for me, I indeed see it as an interesting live-document, of a gig I surely would have loved to see for the way it gradually builds up towards its trashy noiseclimax. I already wrote a review of one of Josetxo Grieta previous releases [you can still read it here], the “peeled banana” of that releases’ artwork is re-used for this one. There is a whole concept behind the work of Mattin, a concept that is shared by Taumaturgia and they have loads of links on their sites pointing you to places where you can learn more about what they’re doing, so I suggest you give it a go. As a side-note: I mentioned I didn’t know much of Basque, but it could as well be Catalan (Basque and Catalan are both languages that are spoken in Spain, and part of France, besides the dominant Spanish language – they both have an old and distinct culture, and were oppressed during the regime of Franco – both regions have since then gained more political autonomy).